Mark S. Ashbaugh, Carmen C. Chicone and Richard H. Cushman. 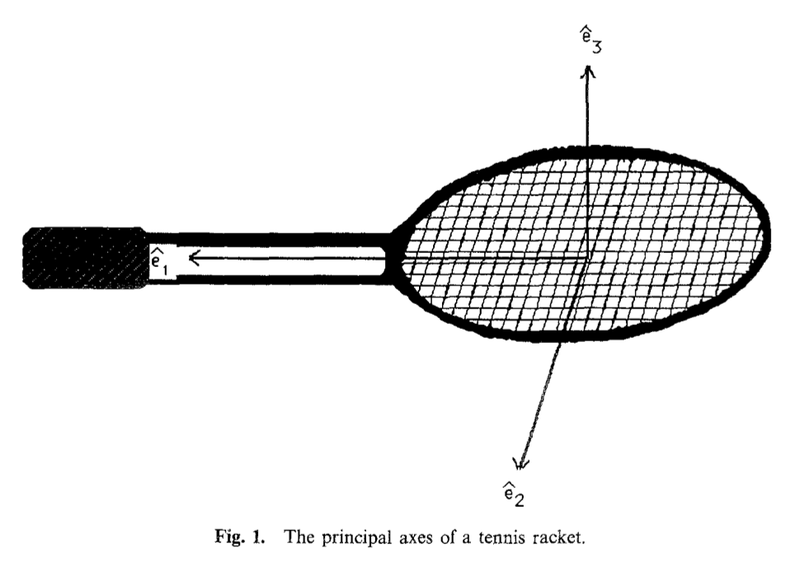 "The Twisting Tennis Racket", in Journal of Dynamics and Differential Equations, Vol. 3, No. 1, January 1991, pp. 67–85. The classical treatments of the dynamics of a tennis racket about its intermediate axis fail to describe a remarkable aspect of its motion which is revealed in the following experiment. Mark the faces of the racket so that they can be distinguished. Call one rough and the other smooth. Hold the racket horizontally by its handle with the smooth face up. Toss the racket into the air attempting to make it rotate about the intermediate axis (namely, the axis in the plane of the face which is perpendicular to the handle). After one rotation, catch the racket by the handle. The rough face will almost always be up! In other words, the racket typically makes a half-twist about its handle.